Long ago a merchant of Iran had a very beautiful parrot. The merchant had brought that parrot catching from the forest of Hindustan. The parrot talked very sweet and was very dear to the merchant. Once the merchant had to go to Hindustan to trade. 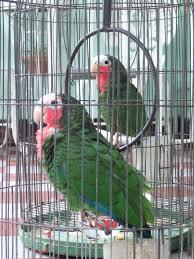 Before going to travel he went near the cage and said to the parrot. Dear Parrot! I am going to your country Hindustan. There I will pass from that forest where your relatives live. If you want to deliver any message tell me. The Parrot replied. Master! Just say this to my relatives that they live happily in the green forests of dear homeland, breath in free airs but me an unfortunate alone, far from my homeland, is getting restless to meet them. O an unfaithful parrot! I loved you so much but you cheated me. The parrot said listening this You loved me because I entertained you through my gossips. But foolish man! You yourself told me the way to get out of here which my relative had told through message. Then when I acted upon his trick and pretended to be dead you yourself made me free. Now you yourself tell me, when you have done everything with your own hands then why are you blaming me?'' To say that the parrot bade his master and went towards his country happily.